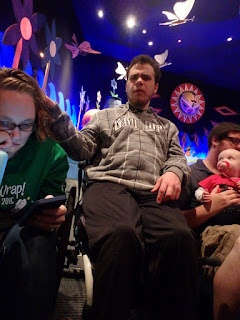 Mik usually won't go on 'it's a small world' at the Magic Kingdom because of a bad experience with the style of accessible boat here the first time. This trip he was willing to give it another try because we were with a larger group, had a Fastpass+, and mostly because it seems to be Nora's favorite ride. 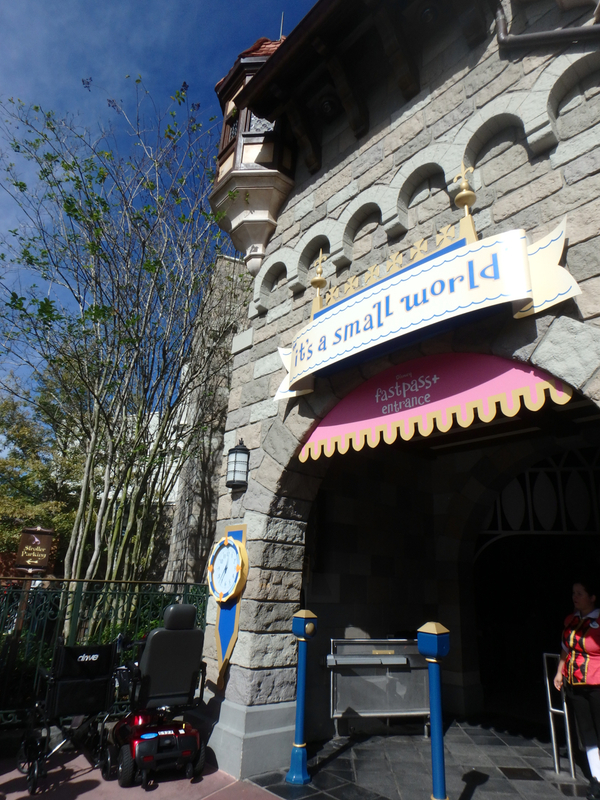 Whether you have a Fastpass or not, you are sent through the wheelchair entrance, which is at the ride exit to the right of the entrance. With a Fastpass, we were able to go to the wheelchair entrance immediately and I assume they give you a return time like we got at Star Tours if you don't have a Fastpass. 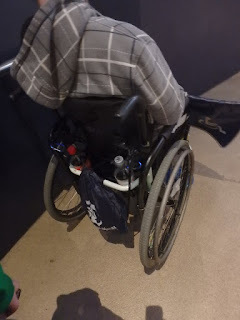 The one major problem with the wheelchair entrance is that it is on a ramp and you have to wait there for the boat to come around (or even longer if there's other groups there). When we got off they had many groups waiting on the ramp, which just doesn't make sense except they don't have enough room to have them wait up top and only send down groups one or so at a time like I remember them doing at Disneyland. Mik particularly disliked the set up of a rope at the end of the ramp where you had to wait because I rolled him partly under the rope in order to leave him on the flat area. The style of boat with you rolling in back and then down the aisle in the middle is much more efficient than the lift style at Disneyland. However, it means that the rest of the group has to sit in single seats on either side of the aisle. It does mean Mik gets to be more with the rest of the group than by himself in the back, but we'd prefer that others in the group could still sit together. The reason Mik hated the ride and wouldn't go on it again until now is because the chair tilted and the casters came up a few inches at the start and end the last time we did this ride (the similar boat ride in Mexico was even worse). This time they ended up putting him between the second row instead of all the way forward and he did not have that problem, so not sure if it is the location of the chair in the boat or it really is smoother now. Overall Mik was glad he gave it another try even if he did end up saying "it's the worst ride after all" because the ride ended up going down and we were stuck almost at the end for about 10 to 15 minutes. 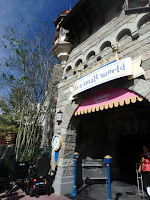 Also, 'it's a small world' was down our last Disneyland trip, so we hadn't been on it in awhile at any park. We also found it interesting that the Magic Kingdom one is so different seeming because they haven't added Disney characters like they've done at Disneyland.